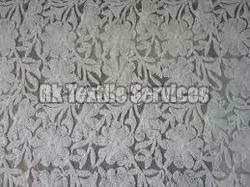 We are instrumental is offering a wide collection of All Over Embroidered on Dyeable Fabrics . The offered fabric is designed by our adept professionals using high quality fabric that we procure from the most certified vendors of the industry. Also, it is designed at par with the international quality standards and is made available in various attractive designs, sizes and patterns in the market. Clients can avail this border from us at affordable prices.